The email message and even the sender (customerservice@unionbankph.com) seem to be true and legitimate, but I just got a feeling that something's fishy with this email. 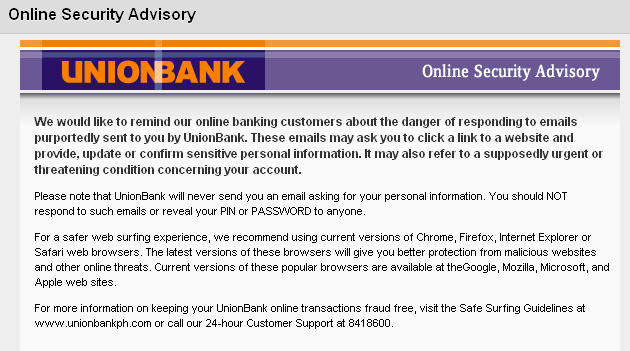 When I hover the mouse over the link "RESOLVE", the hyperlink displayed on the lower left most of the browser that once clicked, it will not be directed to UnionBank's page but rather to another website. So better NOT to click the link, but rather, go directly to their official website to check. 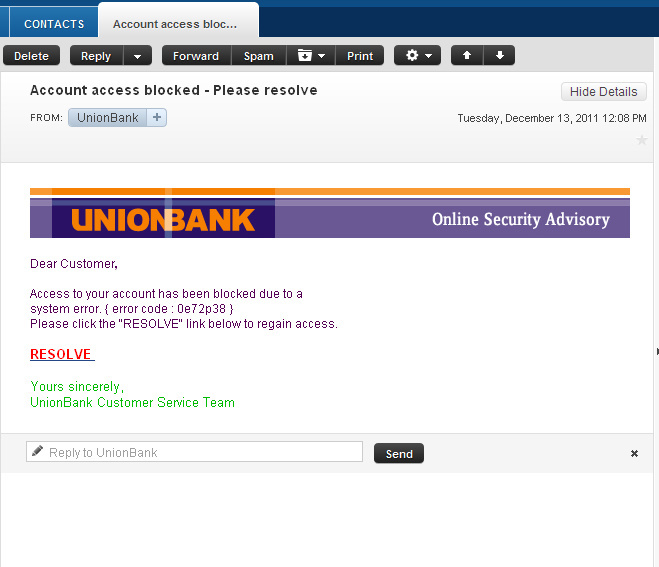 So, I opened another window, typed in their website: http://unionbankph.com, and logged-in to my account. My account was perfectly fine without any hint of being blocked, and it proves that the email that I have received was just a phishing e-mail used by phishers to deceive and steal financial information and password. "Phishing is a way of attempting to acquire information such as usernames, passwords, and credit card details by masquerading as a trustworthy entity in an electronic communication. Communications purporting to be from popular social web sites, auction sites, online payment processors or IT administrators are commonly used to lure the unsuspecting public. Phishing is typically carried out by e-mail spoofing or instant messaging, and it often directs users to enter details at a fake website whose look and feel are almost identical to the legitimate one. Phishing is an example of social engineering techniques used to deceive users, and exploits the poor usability of current web security technologies..."
"It alludes to "baits" used in hopes that the potential victim will "bite" by clicking a malicious link or opening a malicious attachment, in which case their financial information and passwords may then be stolen."